Quantitative research goes a long way in helping to understand any topic. The numbers don’t lie. If four out of five dentists surveyed recommend a product, that’s an 80 percent approval rating, and that’s significant. But of equal importance would be hearing what those dentists say about the product, or about products they do not approve of. That’s where qualitative research comes into play, and in Spectrem’s new Profile Series of studies about doctors, lawyers and accountants, participants were given the chance to discuss their attitudes toward financial advisors rather than just answer yes-or-no questions. The responses are especially interesting when they come from the accountants who were interviewed for the Profile Series study on the high-level, affluent bookkeepers of the world. 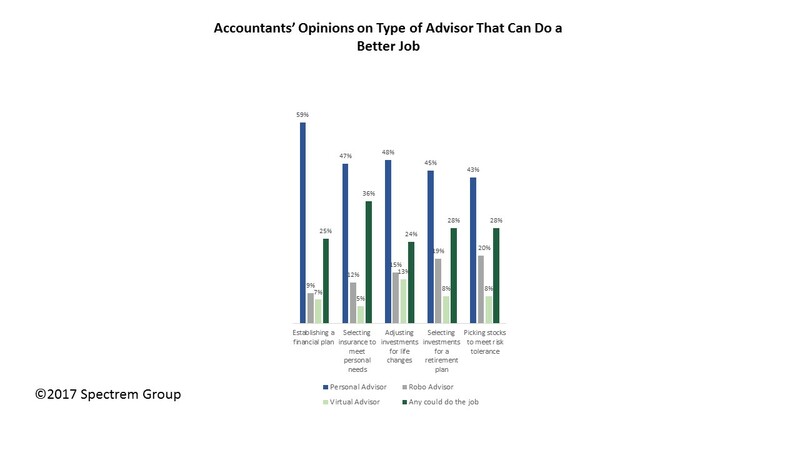 Accountants relate to financial advisors better than most clients because, like advisors, accountants serve clients by helping them make financial decisions. Seventy-nine percent of Millionaire accountants use advisors, and 29 percent of them use a Full Service Broker as their advisor. Thirteen percent consider their accountants to be their primary financial advisor, which is telling. “Mine is a full service broker house,’’ said one accountant. “He helped me put together an array of options that suited what I was looking for based on my budget. Accountants are also more likely to be knowledgeable investors. In fact, 91 percent of the surveyed accountants self-identified as knowledgeable or very knowledgeable about financial and investment products. This knowledge level is certain to play a role in the client-advisor relationship when the client is an accountant. “I often pay attention to financial and investment news,’ said another accountant, making a claim many of the accountants share, that they watch financial news network programs and read investment news publications to stay current on the topic. Obviously, there are accountant clients more involved than others – “I am generally fascinated with investing and consumer psychology. Doing research on investing is a personal interest of mine’’ answered one accountant – but it makes sense that accountants would want to have some knowledge on the subject because even as a bookkeeper, accountants need to know how investments are handled form a tax and deduction standpoint. Perhaps out of professional respect and courtesy resulting from their similar professional paths, accountants hold their advisors in high regard, more so than do other investors. “He works to suit my needs and is attentive to my goals,’’ said one accountant. “He responds when I call him and is very proactive in helping when needed,’’ said another. Accountants noted that when they looked for their advisor, they made decisions similar to the decisions their clients made when they went looking for an accountant. But, because accountants are knowledgeable about financial matters, some of them use their primary advisor in ways not considered by investors who are not as attached to the economy and financial issues as accountants are. There are hundreds of quotes from accountants in the Spectrem Profile Series study, many of them revealing in how accountants view advisors and their own investment decision-making. Like with the Doctors and Lawyers Profile Series study, the accountants are not afraid to state exactly what they think when it comes to receiving professional assistance for investment concerns.